From the Computational Neurobiology Laboratory (D.A.P. ), Salk Institute for Biological Studies, La Jolla, CA; Department of Physiotherapy (P.B. ), Glasgow Royal Infirmary, Glasgow, UK; Institute of Musicians' Medicine (H.-C.J. ), Dresden University of Music Carl Maria von Weber, Dresden; Institute of Music Physiology and Musician's Medicine (E.A. ), Hanover University of Music, Drama and Media, Hanover, Germany; and Movement Disorders Division (S.J.F. ), Mount Sinai School of Medicine, New York, NY. Musician's dystonia (MD) is a focal adult-onset dystonia most commonly involving the hand. It has much greater relative prevalence than non-musician’s focal hand dystonias, exhibits task specificity at the level of specific musical passages, and is a particularly difficult form of dystonia to treat. For most MD patients, the diagnosis confirms the end of their music performance careers. Research on treatments and pathophysiology is contingent upon measures of motor function abnormalities. In this review, we comprehensively survey the literature to identify the rating scales used in MD and the distribution of their use. We also summarize the extent to which the scales have been evaluated for their clinical utility, including reliability, validity, sensitivity, specificity to MD, and practicality for a clinical setting. Out of 135 publications, almost half (62) included no quantitative measures of motor function. The remaining 73 studies used a variety of choices from among 10 major rating scales. Most used subjective scales involving either patient or clinician ratings. Only 25% (18) of the studies used objective scales. None of the scales has been completely and rigorously evaluated for clinical utility. Whether studies involved treatments or pathophysiologic assays, there was a heterogeneous choice of rating scales used with no clear standard. As a result, the collective interpretive value of those studies is limited because the results are confounded by measurement effects. We suggest that the development and widespread adoption of a new clinically useful rating scale is critical for accelerating basic and clinical research in MD. MD is usually associated with loss of fine control and coordination, most commonly in heterogeneous subsets of digits 2–5.5,8,–,10 The relative amount of excessive finger flexion or extension,8,11 as well as which hand is affected, depends on the type of instrument.8 Among the focal dystonias, MD exhibits some of the most exquisite task specificity. In many cases, symptoms appear only while playing the instrument and only in specific passages of specific pieces.12 Symptoms are most likely to occur during performance of rapid, alternating, descending, or ascending patterns. The whole spectrum of research on MD—from basic pathophysiology to clinical management—depends critically on our ability to measure the symptoms. Based on the Dystonia Study Group23 guidelines tailored for musician's dystonia,24,25 a clinically useful rating scale for MD should be 1) reliable and valid, 2) sensitive to change, 3) specifically designed to measure MD, and 4) practical in a clinical setting. If rating scales have insufficient clinical utility, and different studies use different measures, it brings into question the informative value of those studies. The aim of the present study was to comprehensively review rating scales and their use in studies of MD. In 2007, Spector and Brandfonbrener25 published an insightful review of MD rating scales with inclusion criteria based on literature search key words, interventional outcome evaluation, and a minimum of 50% of the subjects identified as having a diagnosis of primary MD. That review was based on 7 articles. We used considerably less restrictive inclusion criteria in the present review covering 135 articles on MD. We characterized the scales and their clinimetric evaluation and assessed the distribution of their use in the literature, including studies involving various treatment approaches and pathophysiologic assays. We did not include disability or quality-of-life measures but instead focused only on scales that provide a measure of functional motor impairment. We searched for (dystonia or dystonic syndrome or dystonic disorder) and (music or musician) in Medline, Web of Science, PubMed, CINAHL, and Cochrane, including only English-language articles and excluding meeting abstracts. 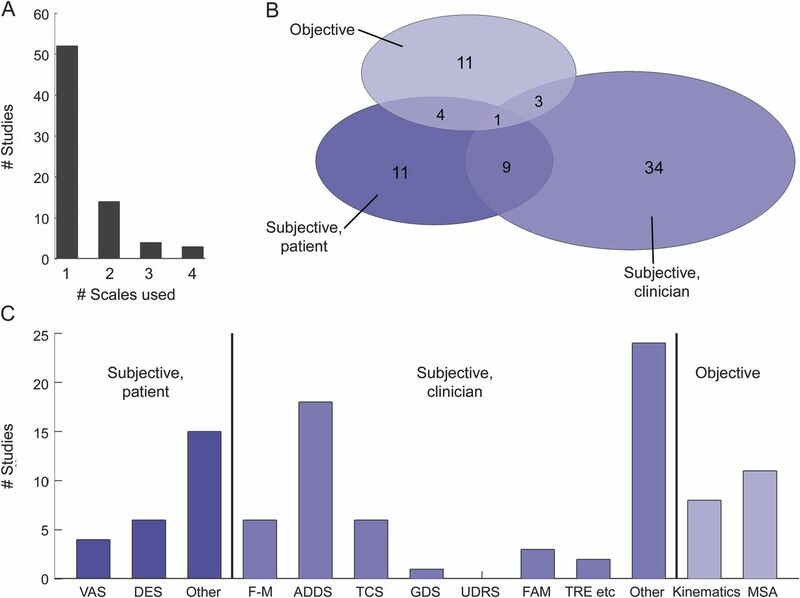 The resulting 239 articles were further subdivided into 3 mutually exclusive groups: studies involving an experimental component (135), reviews/overviews/editorials with no experimental component (66), and other, including studies with no patients with MD (38). Proceeding with only the experimental articles, we further divided them into 2 categories of functional motor assessments: qualitative and quantitative, the latter defined as a study with at least some quantitative functional motor assessments. Among the studies involving quantitative measures, we also identified the rating scales used, the types of treatments involved, and any assays of pathophysiology. We refer to scales by their individual names, except in some cases of coherent classes of such measures, such as visual analog scale (VAS) or kinematics. Spector and Brandfonbrener's25 previous review of MD rating scales distinguished between rating scales vs automated methods. We treat the latter as an instance of the former. The literature distribution is depicted in figure 1A. The number of articles published in each of the 5-year periods from 1981 to 2010 (figure 1B) increased monotonically for the experimental and review groups, with the exception of a notable drop from 2001–2005 to 2006–2010 for the experimental group. Of the experimental articles, almost half (46%) used only qualitative motor function assessments, with the remaining (54%) using at least some form of quantitative assessment (figure 1C). Both categories of publications showed monotonic increases in each of the 5-year periods from 1981 to 2005, then a decrease in 2006 to 2010. The studies involving only qualitative motor assessments include patient- and clinician-rated observational evaluations. In every case, by definition of our inclusion criteria, they included the motor assessment implicit in a clinical diagnosis of MD. Other qualitative assessments were binary descriptions of whether or not patients improved or were able to perform again, as well as more elaborate phenotypic characterizations. The remainder of the analysis focused solely on the quantitative motor function assessments used in MD, hereafter called rating scales (or simply scales). (A) Distribution of literature search results. “Reviews” consists of reviews, perspectives, overviews, and pedagogical material. “Other” consists of experimental studies involving no patients with musician’s dystonia. (B) Temporal distribution of experimental and review publication dates, by half-decades. (C) Among the experimental studies, proportion using qualitative only vs quantitative categories of motor function assessment. (D) Temporal distribution of quantitative and qualitative experimental study publication dates, by half-decades. The rating scales and their clinical evaluation. The complete list of rating scales, terse descriptions, and the extent to which their clinical utility has been evaluated with patients with MD is summarized in table 1. Given the exquisite task specificity often seen in MD, whether or not scales have been evaluated for construct validity has been subdivided into 2 main features: whether or not the musical instrument is used, and whether or not a symptom-evoking musical passage is used. Not all of the scales have been evaluated for intrarater and interrater reliability with patients with MD, and most of those that have were evaluated in only one study.24 Under sensitivity, we conservatively listed studies that involved a treatment, even if statistical sensitivity analysis was not a focus of the study. The efficiency aspect of clinical utility takes into account whether or not the scales require use of the musical instrument and other equipment such as video or motion capture recording. The subjective, clinician-rated type of scales comprised 6 named rating scales. For the sake of brevity, we include here only brief descriptions of each scale. More detailed information can be found in appendices e-1 to e-4 on the Neurology® Web site at www.neurology.org, in the original references, and for the Global Dystonia Rating Scale (GDS), Unified Dystonia Rating Scale (UDRS), and Fahn-Marsden (FM) scale, at the Movement Disorder Virtual University Web site at www.mdvu.org/library/ratingscales/dystonia/. The FM scale30,31,37 was designed primarily for generalized dystonia. The movement component covers 7 body regions, including the arms. For each region, the score is a product of 2 ordinal factors: symptom frequency and severity. The scale has nothing specific to digits. To be more sensitive to focal dystonias of the arm, Fahn developed the Arm Dystonia Disability Scale (ADDS).31 It elaborates the FM scale with ordinal scoring of motor function difficulty separately in each of 7 specific activities using the arm, one of which is playing a musical instrument (see appendix e-1). The Tubiana and Chamagne Scale (TCS)4,16 is specific to music performance, but not specific to the hand. It is an ordinal scale of musical capabilities (see appendix e-2). The GDS is usually attributed to the Dystonia Study Group.37 As with the FM scale, its original application was for a large variety of dystonias, including generalized and segmental forms of the disease. It uses a Likert-type scale for severity. Ratings are made for individual body areas, one of which is the hand and distal arm. Spector and Brandfonbrener24,25 developed the Frequency of Abnormal Movements scale (FAM), motivated by the observation by Candia et al.28 of common patterns of flexion and extension. Based on video-recorded performance, individual digits exhibiting abnormal flexion, extension, or adduction are first identified by observation, then quantified in terms of symptom frequency by scoring the whole video. In an adaptation of the FAM, Berque et al.35 have patients perform easy- and medium-difficulty pieces, and multiplied single protracted abnormal digit movements by their duration. de Lisle and colleagues38,39 developed and used a collection of scales: Test Repertoire Evaluation (TRE), Visual Evaluation Rating, Scale Quality Evaluation Rating, and Dystonic Hand Identification Evaluation (see appendix e-3). The distribution of rating scale use in the MD literature is shown in figure 2. Most studies use one rating scale (52/73), with a minority using 3 or 4 scales (7/73). Figure 2B shows the number of studies using each type of scale. Few studies use more than one type of scale, and only one study26 uses all 3 types. There is a broad distribution of use of the individual scales (figure 2C). The ADDS is the most common choice. For both the subjective, patient-rated and subjective, clinician-rated types of scales, the other category dominates, suggesting that the distribution depicted actually understates the heterogeneous use of scales in MD. Of the studies using quantitative scales, only 26% used an objective scale, or just over 10% of all the experimental studies surveyed. Within experimental studies using quantitative motor function assessments, (A) histogram of number of scales used in each study, (B) number of studies using each type of scale (subjective by patient, subjective by clinician, objective, or combinations thereof), and (C) number of studies using each scale, grouped by type. Among the 61 studies identifying some form of treatment, 15 (25%) included only qualitative assessments and 46 (75%) included quantitative assessments. Among 68 studies involving pathophysiologic assays, 32 (47%) included only qualitative assessments and 36 (53%) included quantitative assessments. Table 2 shows the rating scales used across studies involving treatment, including, e.g., trihexyphenidyl, botulinum toxin injections, and various physical therapy and transcranial stimulation protocols. A similar table (appendix e-6) shows the rating scales used across studies involving pathophysiologic assays, including, e.g., somatosensory function, temporal discrimination thresholds, voxel-based morphometry, fMRI, EMG, EEG, evoked potentials/fields, transcranial magnetic stimulation, nerve conduction velocity, and genetics. Complete bibliographies for both tables are provided in appendices e-5 and e-7. Quantitative motor function measures in MD. We comprehensively reviewed the use of rating scales in studies of MD, characterizing the scales, their clinimetric evaluation, and the distribution of their use in the MD literature. MD is an area of growing interest in movement disorders, as evidenced by the rapidly growing number of publications over the past few decades. Curiously, however, the ratio of publications reporting experimental results to nonexperimental (e.g., review) publications decreased in the last decade. 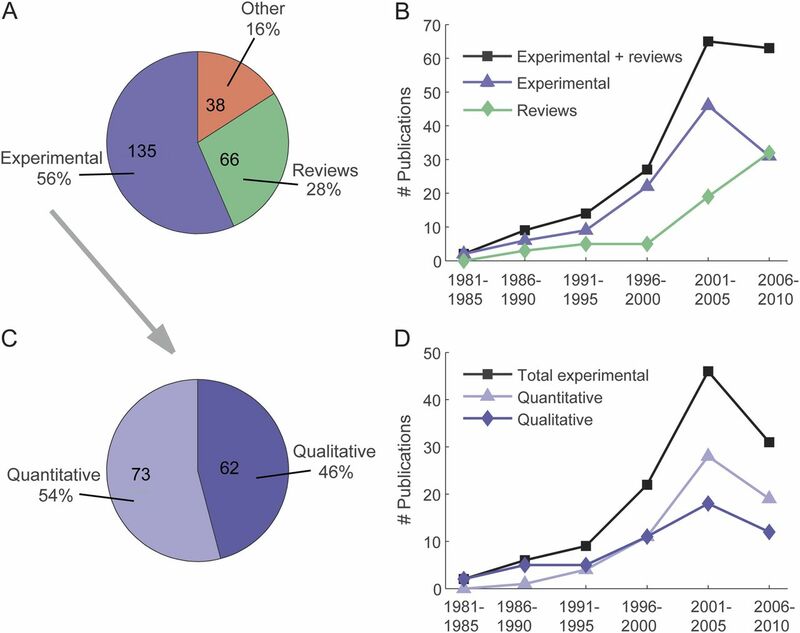 In fact, in the period 2006–2010, there were more reviews of MD published than experimental reports. The reason for this is unclear. It may be a natural compensatory response to an experimental literature using an increasingly fractionated collection of motor function measures. Furthermore, almost half of all published experimental studies have used only qualitative assessments. In the past decade, the ratio of quantitative to qualitative motor assessments has increased. However, these actually underreport the amount of qualitative assessment of MD, because we placed studies using both qualitative and quantitative assessments of motor function under the quantitative category. Among the quantitative motor function assessments used in MD studies (table 1 and figure 2C), we describe 12 that we termed scales. However, 2 of these are collections of either patient- or clinician-rated subjective ratings, not named as scales per se. Thus the actual number of distinct quantitative motor function assessments used in MD is actually considerably higher, on the order of 20. None of the scales has been completely and rigorously evaluated for MD with respect to the Dystonia Study Group's guidelines for a maximally useful rating scale,25 i.e., reliable and valid, sensitive to change, practical in a clinical setting, and specifically tailored to MD. Many of the scales rely on inherently subjective human evaluation, use ordinal ratings, and lack digit-level specificity. As a result, they suffer from interrater variability, lack the sensitivity needed to compare treatments with roughly similar efficacy, and cannot represent the usually digit-specific nature of MD symptoms. Some of the initial dystonia rating scales were designed for generalized dystonia or focal forms other than MD. They commonly represent global impressions, based on clinical observation but not tailored to task-specific motor impairments. The FM scale, UDRS, and GDS are meant to cover the various somatotopic distributions of a wide variety of focal and generalized dystonias and are not specific to MD. In the case of the FM scale, abnormal arm motor function would be diluted in the overall score by normal function in each of 6 other body regions. Analogously for the ADDS score, hand motor function abnormalities limited to musical performance are diluted by normal hand function in each of 6 other activities. Also, as with other ordinal scales, treatment outcomes measured with ADDS have to be interpreted with caution, because, for example, an incremental improvement from marked to minor could be viewed as a 33% improvement. Despite the marked task specificity in MD, only the TCS, FAM, and TRE scales incorporate a symptom-evoking performance element, and only a few studies use these scales. Lack of standards in MD rating scale use. We are unaware of any past efforts to unify or standardize the various rating scales used for MD. Relatively newer scales tend to be used repeatedly by the same group and much less so, if at all, by other groups. Interestingly, the UDRS, despite a name suggestive of standardization, has to our knowledge never been used with MD. This lack of standards has been visible before in meta-analyses of paramedical interventions in MD,55 and is more comprehensively illustrated in the present analysis. The remarkable sparsity evident in table 2 highlights the fact that not only do most studies use only 1 or 2 rating scales, but also that there is great diversity in the choice of rating scale. This makes it difficult to dissociate treatment from measurement effects.23,25 Furthermore, a conjunction of table 1 (identifying the extent to which scales have been evaluated for clinical utility) and table 2 (identifying which studies have used which scales) would produce a dim picture of the clinical utility of the studies listed in table 2. Thus it appears that research on treatments is aggressively proceeding without sufficient standardized tests of the motor function measures on which they are based.25 Likewise, in research on the pathophysiology of MD, the diversity (and in some cases absence) of quantitative motor function measures limits the inferences that can be made about mechanisms of motor dysfunction. In the face of what are often methodologically sophisticated pathophysiology measures, this may at first seem paradoxical. Yet it may be that the very complexity of some physiologic measures, often reflected in lengthy Methods sections in those studies, has inadvertently relegated motor function measures to a minority role. Unfortunately, the insufficient attention to motor function assessment severely limits the interpretive value of the hard-won physiologic results. We view the lack of a standard clinically useful rating scale as a major strategic impediment to progress in MD research. A new rating scale for MD that is reliable, valid, sensitive, and specific to MD is sorely needed.5,25 If adopted as a standard, it would facilitate more objective and veridical evaluations of various treatments, thereby providing a stronger measure of treatment efficacy in pretreatment/posttreatment assessment and more precise longitudinal assessment in natural history studies. It would likewise help inform basic research into the pathophysiology of MD, in which interpreting physiologic findings has previously been confounded by deficiencies in, and a lack of standards among, our abilities to measure symptoms. The better-informed basic research into mechanisms should, in the long term, translate into new treatment strategies for this most perplexing of movement disorders. Dr. Peterson: study concept and design, acquisition of data, analysis and interpretation, manuscript preparation and revision. Mr. Berque: study concept and design, analysis and interpretation, critical revision of the manuscript for important intellectual content. Dr. Jabusch: study concept and design, critical revision of the manuscript for important intellectual content. Dr. Altenmüller: study concept and design, critical revision of the manuscript for important intellectual content. Dr. Frucht: study concept and design, critical revision of the manuscript for important intellectual content. Funding for this study was provided by the NIH (5T32-MH020002), NSF (Temporal Dynamics of Learning Center, SBE-0542013, and Mind, Machines, Motor Control, EFRI-1137279), Benign Essential Blepharospasm Research Foundation, Dystonia Medical Research Foundation, the German Research Foundation (RA 940/121), and the Dystonia Coalition (NS065701). The Dystonia Coalition is part of the NIH Rare Diseases Clinical Research Network and has support from the NIH Office of Rare Diseases Research and National Institute of Neurological Disorders and Stroke. D. Peterson has received funding for travel from the Dystonia Medical Research Foundation and research support from the Benign Essential Blepharospasm Research Foundation, NIH (5T32-MH020002), NSF (Temporal Dynamics of Learning Center, SBE-0542013, and Mind, Machines, Motor Control, EFRI-1137279), and the Dystonia Coalition (NS065701). P. Berque reports no disclosures. H.-C. Jabusch is head of the Institute of Musicians' Medicine at the Dresden University of Music Carl Maria von Weber, Dresden, Germany, and is a full professor paid by the Dresden University of Music Carl Maria von Weber. The Institute of Musicians' Medicine has received funding from a private donor without ties to the medical field and with no economic interests that are in any way related to the present study. Dr. Jabusch also contributed to a CME course funded by Merz Pharma GmbH, Germany. E. Altenmüller is chairman and full professor paid by the University of Music, Drama and Media, Hannover, Germany. He serves on the editorial boards of the following journals: Journal of Interdisciplinary Music Studies, Medical Problems of Performing Artists, Musicae Scientiae, Music and Medicine. He receives research grants from the German Research Foundation (Al 269/5-3, Al 269/7-3), from the European Marie Curie Actions, from the Lichtenberg Scholarship Program of Lower Saxony, and from the Dystonia Medical Research Foundation. He receives royalties from the publication of the book Music, Motor Control and the Brain (Oxford University Press, 2006). He received honoraria for teaching courses on the application of botulinum toxin A by Allergan (Botox), Ipsen Pharma (Dysport), and Desitin/Merz (Xeomin). S.J. Frucht has received funding for travel or speaker honoraria from Jazz. Pharmaceuticals, Lundbeck, Inc., and Merz Pharmaceuticals, LLC; receives publishing royalties for Movement Disorders Emergencies: Diagnosis and Treatment (Humana Press, 2005); and serves/has served as a consultant for UCB, Jazz Pharmaceuticals, Merz Pharmaceuticals, LLC, GE Healthcare, and Allergan, Inc. Go to Neurology.org for full disclosures. The authors thank the Dystonia Medical Research Foundation (DMRF) and the Musicians with Dystonia group for their continuing support of MD research and advocacy and Karen Heskett, University of California San Diego Biomedical Library, for help designing our literature search. Preliminary results for this review were presented at the Musician's Dystonia Summit, New York, March 2012. Accepted in final form April 22, 2013.
. Musician's cramp as manifestation of maladaptive brain plasticity: arguments from instrumental differences. Ann NY Acad Sci 2012;1252:259–265.
. The natural history of embouchure dystonia. Mov Disord 2001;16:899–906.
. Limb immobilization for occupational dystonia: a possible alternative treatment for selected patients. Adv Neurol 2004;94:247–254.
. Musician's focal dystonia. In: Tubiana R, Amadio PC, eds. Medical Problems of the Instrumentalist Musician. London: Martin Dunitz; Distributed in the U.S. by Blackwell Science; 2000:329–342.
. Movement disorders in musicians. Mov Disord 2008;23:1957–1965.
. Task-specific dystonias: a review. Ann NY Acad Sci 2008;1142:179–199.
. Focal dystonia: advances in brain imaging and understanding of fine motor control in musicians. Hand Clin 2003;19:523–538.
. Focal task-specific dystonia of the musicians' hand-a practical approach for the clinician. J Hand Ther 2009;22:136–142.
. Dystonia in musicians. Semin Neurol 1989;9:131–135.
. Ulnar neuropathy and dystonic flexion of the fourth and fifth digits: clinical correlation in musicians. Muscle Nerve 1996;19:431–437.
. The hand that has forgotten its cunning: lessons from musicians' hand dystonia. Mov Disord 2008;23:1398–1406.
. Musician's focal dystonia. Hand Clin 2003;19:303–308.
. Long-term outcome of focal dystonia in string instrumentalists. Mov Disord 2004;19:43–48.
. Occupational disorders in instrumental musicians. Med Probl Perform Art 2004;19:123–128.
. Neuromuscular problems in musicians. Neurologist 2002;8:163–174.
. Medical professional problems of the upper-limb on musicians. Bull Acad Natl Med 1993;177:203–216.
. The challenge of diagnosing focal hand dystonia in musicians. Eur J Neurol 2009;16:864–869.
. Epidemiology, phenomenology, and therapy of musician's cramp. In: Altenmüller E, Kesselring J, Wiesendanger M, eds. Music, Motor Control and the Brain. Oxford: Oxford University Press; 2006:265–282.
. Abnormal reorganization in focal hand dystonia - sensory and motor training programs to retrain cortical function. NeuroRehabilitation 2008;23:43–53.
. Neuromuscular and musculoskeletal problems in instrumental musicians. Muscle Nerve 2003;27:549–561.
. Embouchure problems in brass instrumentalists. Med Probl Perform Art 2001;16:53–57.
. Slow down exercise for the treatment of focal hand dystonia in pianists. Med Probl Perform Art 2006;21:25–28.
. Rating scales for dystonia: assessment of reliability of three scales. Adv Neurol 2004;94:329–336.
. A new method for quantification of musician's dystonia: the frequency of abnormal movements scale. Med Probl Perform Art 2005;20:157–162.
. Methods of evaluation of musician's dystonia: critique of measurement tools. Mov Disord 2007;22:309–312.
. Regaining motor control in musician's dystonia by restoring sensorimotor organization. J Neurosci 2009;29:14627–14636.
. Constraint-induced movement therapy for focal hand dystonia in musicians. Lancet 1999;353:42.
. Sensory motor retuning: a behavioral treatment for focal hand dystonia of pianists and guitarists. Arch Phys Med Rehabil 2002;83:1342–1348.
. Finger movement discrimination in focal hand dystonia: case study of a cellist. Med Probl Perform Art 2005;20:77–81.
. Validity and reliability of a rating-scale for the primary torsion dystonias. Neurology 1985;35:73–77.
. Assessment of the primary dystonias. In: Munsat TL, ed. Quantification of Neurologic Deficit. Oxford: Butterworths; 1989:241–270.
. A combination of constraint-induced therapy and motor control retraining in the treatment of focal hand dystonia in musicians: a long-term follow-up study. Med Probl Perform Art 2013;28:34–47.
. Limb immobilization for the treatment of focal occupational dystonia. Neurology 2001;57:405–409.
. Quantification of focal dystonia in pianists using scale analysis. Mov Disord 2004;19:171–180.
. A combination of constraint-induced therapy and motor control retraining in the treatment of focal hand dystonia in musicians. Med Probl Perform Art 2010;25:149–161.
. Prolonged neuromuscular rehabilitation for musician's focal dystonia. Med Probl Perform Art 2003;18:166–169.
. Rating scales for dystonia: a multicenter assessment. Mov Disord 2003;18:303–312.
. Effects of pianism retraining on three pianists with focal dystonia. Med Probl Perform Art 2006;21:105–111.
. Pianism retraining via video conferencing as a means of assisting recovery from focal dystonia a case study. Med Probl Perform Art 2010;25:126–129.
. Three-dimensional movement analysis as a promising tool for treatment evaluation of musicians' dystonia. Adv Neurol 2004;94:239–245.
. Delta 9-tetrahydrocannabinol improves motor control in a patient with musician's dystonia. Mov Disord 2004;19:990–991.
. Retraining and transcranial direct current stimulation in musician's dystonia: a case report. Mov Disord 2010;25:1758–1760.
. Transient improvement induced by motor fatigue in focal occupational dystonia: the handgrip test. Mov Disord 2001;16:1143–1147.
. Double-blind trial of botulinum toxin for treatment of focal hand dystonia. Mov Disord 1995;10:466–471.
. Failure of cathodal direct current stimulation to improve fine motor control in musician's dystonia. Mov Disord 2010;25:389–393.
. Botulinum toxin injections in the treatment of musician's dystonia. Neurology 2005;64:341–343.
. Focal dystonia in musicians: treatment strategies and long-term outcome in 144 patients. Mov Disord 2005;20:1623–1626.
. Long-term follow-up of botulinum toxin therapy for focal hand dystonia: outcome at 10 years or more. Mov Disord 2011;26:750–753.
. Effective behavioral treatment of focal hand dystonia in musicians alters somatosensory cortical organization. Proc Natl Acad Sci USA 2003;100:7942–7946.
. Constraint-induced movement therapy: a new family of techniques with broad application to physical rehabilitation: a clinical review. J Rehabil Res Dev 1999;36:237–251.
. Does instrumented movement analysis alter, objectively confirm, or not affect clinical decision-making in musicians with focal dystonia? Med Probl Perform Art 2008;23:99–106.
. Sensorimotor skills and focal dystonia are linked to putaminal grey-matter volume in pianists. J Neurol Neurosurg Psychiatry 2011;82:1225–1231.
. The influence of practice on the development of motor skills in pianists: a longitudinal study in a selected motor task. Hum Mov Sci 2009;28:74–84.
. EEG oscillatory patterns are associated with error prediction during music performance and are altered in musician's dystonia. Neuroimage 2011;55:1791–1803.
. Paramedical treatment in primary dystonia: a systematic review. Mov Disord 2009;24:2187–2198.